Beyblade G-Revolution is the third season of the cult hit anime television program, Beyblade. The series was based off of the manga created and written by Takao Aoki. The plot of the series revolves around beybladers, groups of beyblade enthusiasts whom use the spinning top-like devices to battle each other in grand tournaments. 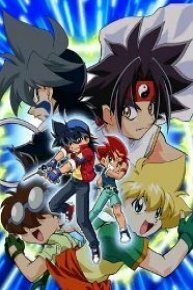 At the start of Beyblade G-Revolution, the primary character, Tyson, the former world champion is left forlorn when his former world winning teammates decide to leave him to test their mettle on their own. However, a new and powerful threat throws the beybladers once again together to fight the menace.